UP B.El.Ed Admission 2019 is called Bachelor of Elementary Education of 4 years UP B.El.Ed Online Form released for 12th pass students. To apply online for UP BEl.Ed programme aims to produce graduates of high caliber in the field of teacher education. Teaching in elementary schools (Classes I to VIII): B.El.Ed. Graduates are eligible for appointment in MCD, NDMC, and Sarvodaya Vidyalayas in Delhi, Kendriya Vidyalayas and Navodaya Vidyalayas all over India and also in private schools. It is popular course after UP BTC Admission 2018 which Pursuing Post-graduate courses and research studies in education and related disciplines. Lucknow University B. El. Ed Admission 2019: Lucknow University is the First to introduced B. El. Ed.DEGREE Course which is of 4 years. Applicants can apply for more details in below section. 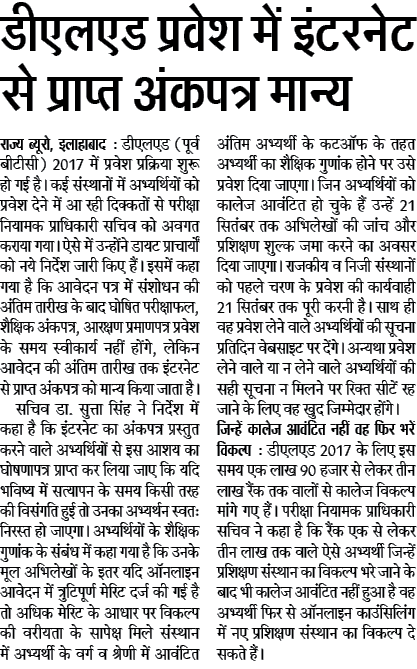 UP B.El.Ed Vacancy 2018:- Latest News of 17 July is UP Government has approved Primary Teacher vacancies of Bachelor Degree holder in elementary education. we are writting about more on this soon come back. UP BTC Seat Allotment Result 2018 : For filling 2 Lakh seats Latest News Student are allowed to check merit list of DED starting from June and D.El.Ed Board given relaxation on submitting certificate of Internet who have passed but students can able to get original certificates. UP B.El.Ed Syllabus 2018 Course Question Paper: The student-teacher is expected to study 19 theory courses during the 4 year programme of study. Theory courses include UP B.El.Ed syllabus study through projects and related field work. The total weight age of the theory courses in the B.El.Ed. Programme is 1,250 marks out of an aggregate of 2,200 marks. Educational Qualification: Candidates who want to make career in Assistant teacher jobs in UP after 12th pass than he or she should take admission to UP B.El.Ed Programme should have cleared the higher secondary examination or any other examination recognized as equivalent thereto with a minimum aggregate of 50 % marks. UP B.El.Ed College List 2018 : In UP B.El.Ed Govt Private College List Instructions for filling up the online B.El.Ed Application Form. The admission for B.El.Ed. Programme (2017) will be done as based on filling up the offline form only. The candidates applying for B.El.Ed are required: 1) Personal Information 2) Educational Information 3) File Uploads, 4) Security Code and Undertaking and 5) Payment Information. B.El.Ed University & Degree College List: Amity University Noida, Astron College of Education Meerut, Bundelkhand University Jhansi, Bansidhar Mahavidyalay Jalaun. UP B.El.Ed Entrance Exam Sample Papers pdf: All admissions to the B. El. Ed. programme 2017 will be made through a Common Entrance Examination (CEE–B.El.Ed.).I. Entrance Test includes All sections and their parts are compulsory. The Written Entrance Test will be of 2 (two) hours duration. It will consist of two sections A and B of Multiple Choice Questions. 1. What is the difference between B.Ed. and B.El.Ed.? B.Ed. is a two year course taken up after graduation or post-graduation whereas B.El.Ed. is a four year integrated course pursued after Class XII and leads to a graduation degree. 2. What is the minimum age requirement? You should have completed 17 years on or before October. There is no age relaxation. 3. What is the medium of B.El.Ed course? 4. What all should one consider when deciding the college? The short listed candidates will be called for Centralized Counselling according to their merit. 5. Can I do post graduation after this course? Yes, you can. 6. Can I appear for Civil services after this course? Yes, you can. 7. I have done my class XII from NIOS. Can I apply? Of course, you can. 8. I am from Commerce background. Can I apply? Yes you can, but please make sure you have the right combination of subjects i.e. you can opt any one out of Business Studies and Accountancy. In other words, if you have both Business Studies and Accountancy select the one with higher marks. Remember, both of these cannot be selected. 9. I have Computer Science/ Information / music / Physical Education BPED as one of my subjects in class Intermediate . Will the marks of these subjects be considered while applying for B.El.Ed? c. The subjects that you have mentioned will come as your fourth choice i.e. under List C.
Note: Website will be gain open for 1442 colleges 77850 seats. Note: UP D.El.Ed degree course breaks record of largest applicant have applied. UP D.El.Ed Admission Fees : candidates should pay fees of Rs 400, Rs 200. I have completed my graduation degree in hotel mgt. from Lucknow. Sir Meri merit 186 hai.mai OBC category se hu Kya muje private college milega . Sir mere d el ed registration form me father name me spelling mistake ho gai h, kya usme correction ho sakta h? Up B el ed ka form kab aa rha hai...?? B. El. Ed. Online form date badhegi Kya?? Beled course councilling kab start hogi date fees kitane hoga ple. When b.el.ed. councilling start.. .